Tea is not complete without something sweet! Although, I have just had a cup of tea without any delicacies, there are times when I just want to treat myself. 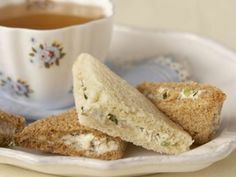 Here is some of my favorite scrumptious recipes for that Tea Hour. In a small bowl, beat cream cheese until smooth. Mix in celery and walnuts. Make sandwiches with cheese mixture. Trim off crusts of bread and cut sandwiches into rectangles or triangles. Garnish plate with sprigs of parsley. Roll into small balls and roll each ball in granulated sugar or press them into candy molds and unmold at once (shake sugar into mold, if necessary, to prevent sticking). Mix dry ingredients. Cut in 6 tablespoons butter until mixture resembles coarse cornmeal. Make a well in the center and pour in buttermilk. If you don’t have buttermilk, use regular milk. Mix until dough clings together and is a bit sticky-don’t over-mix. Turn out dough onto a floured surface and shape into a 6-to-8-inch round about 1 1/2 inches thick. Quickly cut into pie wedges or use a large round biscuit cutter to cut circles. 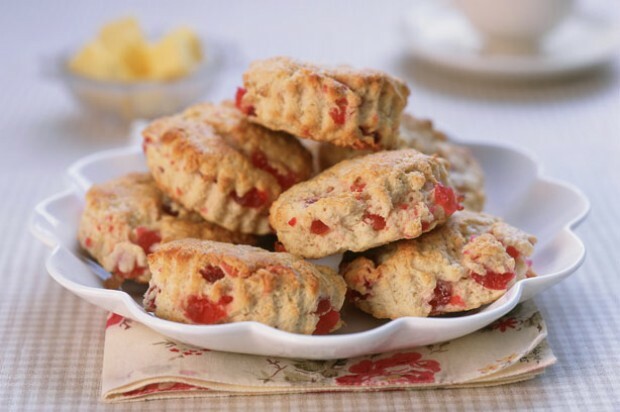 The secret of tender scones is a minimum of handling. Place on a ungreased cookie sheet, being sure the sides of scones don’t touch each other. Bush with egg for a shiny, beautiful brown scone. Bake a 425 for 10 to 20 minutes, or until light brown. In a chilled bowl, beat cream until medium-stiff peaks form, adding sugar during the last few minutes of beating. (If you are using cream crease, just stir together with sugar,) Fold in sour cream and blend. Makes 1 1/2 cups. Recipes are taken from the book If Teacups could Talk, which I highly recommend to any tea enthusiastics!